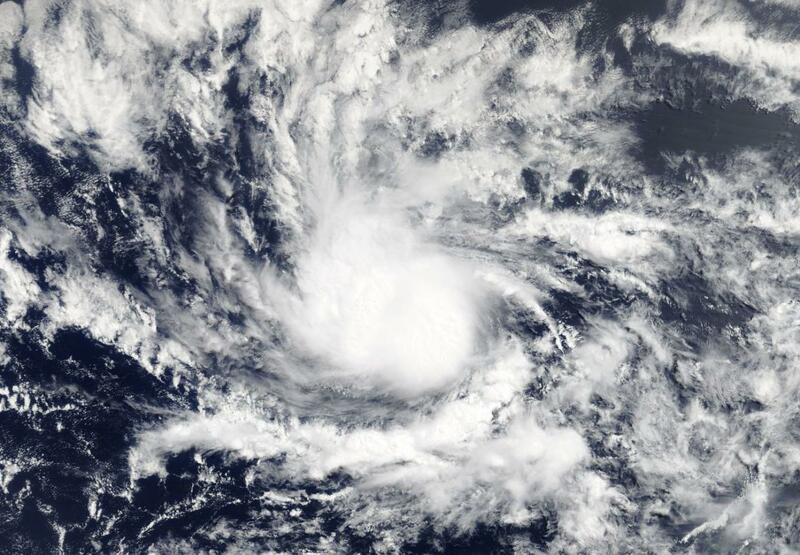 The second tropical cyclone of the North Atlantic Hurricane season formed in the Central Atlantic Ocean and far from land. NASA's Terra satellite provided an early morning look at the small depression. In the pre-dawn hours of July 5, 2018, the Moderate Resolution Imaging Spectroradiometer or MODIS instrument aboard NASA's Terra satellite provided a visible light image of Tropical Depression Two (TD2). The National Hurricane Center (NHC) noted that the small cyclone is surrounded by abundant dry air, and the system will be moving over marginally warm waters during the next few days, which could both limit intensification. At 11 a.m. EDT (1500 UTC), the center of Tropical Depression Two was located near latitude 10.2 degrees north and longitude 41.4 degrees west. That's about 1,385 miles (2,230 km) east-southeast of the Lesser Antilles. The depression is moving toward the west near 16 mph (26 kph). A fast westward to west-northwestward motion is expected through the weekend of July 7 and 8. Maximum sustained winds are near 35 mph (55 kph) with higher gusts. Some strengthening is possible, and the depression could become a tropical storm later today or on Friday, July 6. The system is forecast to degenerate into an open trough east of the Lesser Antilles over the weekend.